It’s July and with the festivities of the fourth’s fireworks and family bbq’s behind us let’s focus on the important things- fishing! We are starting to see some numbers of chrome arriving over Bonneville dam and this year is off to a much better start than last. So far we are behind the 10 year average but well beyond last years start. 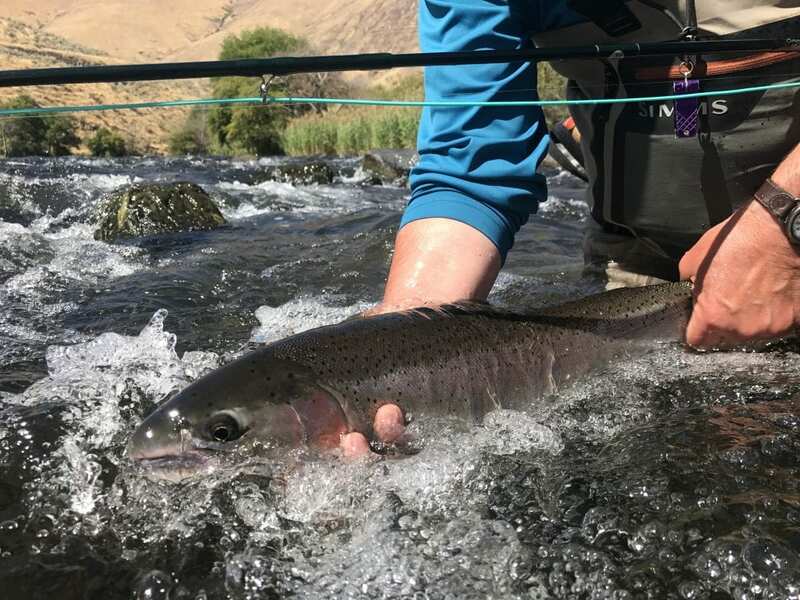 Those are the signs the Water Time guides are watching closely for hints to this year’s Deschutes river crop of steelhead chrome. July is the marker for the run size on the Columbia basin, a good start here is a great indication of the total run size. Already good signs are appearing in my book for good things to come with our anadramous runs in the NW. First, this June we have seen an incredible run of Shad. Last years run was 2.7 million shad at Bonneville dam; this year, a staggering 5.8 million! That’s a huge increase. Shad being plankton eaters points to healthier ocean conditions and with the one year turn around time for shad that means good things should be yet to be seen for our other one year cycle fish. Like sockeye, while down from record numbers, this run was closed and has been re-opened as run size has exceeded projections- another one year ocean cycle fish. Let’s hope these numbers correlate to our one salt-steelhead and into the next few years of good runs! Trout on the Deschutes are working caddis and a small sampling of mayflies this July. Midges are also on the menu and it wouldn’t surprise me if a crawdad or two was on the menu. Hatches had changed drastically since the Selective Water Withdrawl system went in 7 years ago but there are still some great fish to be caught. Focus on oxygenated riffles at evening for the best caddis action. Elk hair caddis in tan sz 16-18 are the go-to producer on top while Silvey’s Prime Time Pupa a killer subsurface.